After some days of more hacking on the plugin, there current state is already nice for my daily use. defines already the complete project for the kate.git. 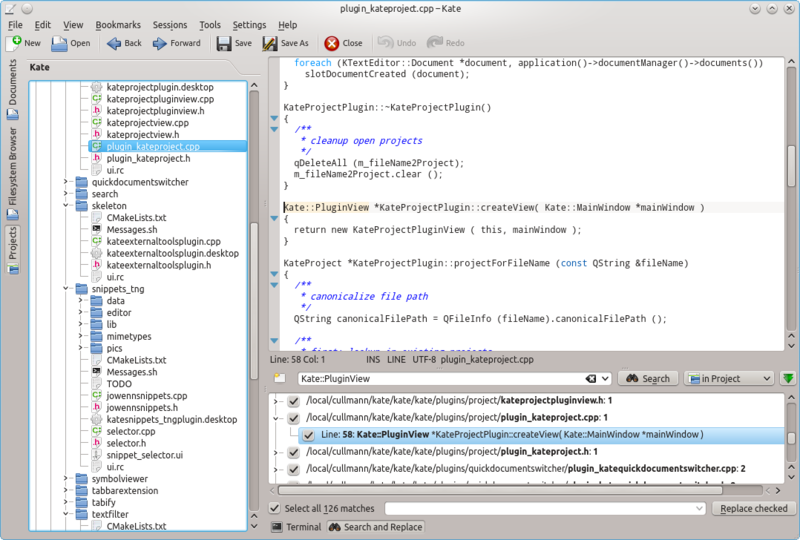 If you open any file with Kate inside your local kate.git clone (and the project plugin from master branch is loaded), Kate will auto-open the project and highlight the file you just opened there in the tree. No need to think about opening some project in the menu, just open the file you want to start working at and start. The project plugin won’t get into your way or require additional steps. It will allow you nice and fast file switching between your project files in the filesystem tree like structure without any noise of non-git tracked files ;) Still the normal “Documents” view is around like it used to be, if you want to just navigate between currently opened files. If you modify the project file, the project will auto-refresh itself, still a reload button is needed to trigger e.g. reparsing of git files, if your add/remove files and want a fresh project tree. The auto-reload won’t help there, as is is more or less a nop if the project file content was unchanged. The “Search and Replace” plugin will integrate nicely and per default will do project wide searches, if any project is currently active (you can switch to other search modes like before in the combobox, just the default is changed, if the project plugin is active). Thanks to Kåre’s nice design of the plugin, this addition was really easy to implement. Exuberant Ctags integration is work-in-progress. At the moment on project load, a background thread will generate a ctags index (after it has constructed the file tree from git/svn/…) and the auto-completion will use this index for all files associated with your project. An additional toolview, that allows you to search inside the index will be implemented, too. It is a bit like the current ctags plugin, but without any setup or manual indexing ;) For the kate.git, the indexing (in the background) needs less than half second, even for kdelibs frameworks branch it is only 2-3 seconds. On Kate exit the index files (created as temp files in your local temp directory) will vanish again. No index database polluting your checkouts/clones or homes. 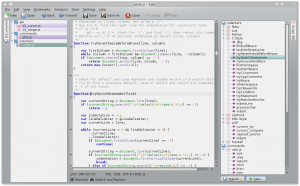 Christoph already wrote several blog posts about the upcoming projects plugin. In his last blog, he mentioned that a project can now be created on-the-fly by reading the git or subversion output: All the files under version control are automatically listed as files in the project. However, this is restricted to git and subversion. 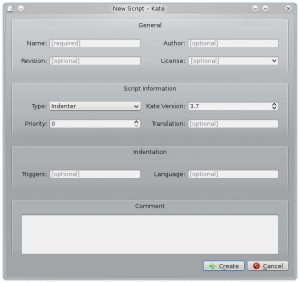 If you always wanted to contribute to Kate, you can give other version control systems a try, such as Mercurial (command: hg manifest). Just quickly build Kate, and send us a patch! Update (2013-10-31): Support was added in commit on 2013-03-02 and is available in KDE 4.10.5 and later versions. it is hard to enumerate all files in the kate.git, as we have .py files, .xml files, .desktop files, .sh files and so on. 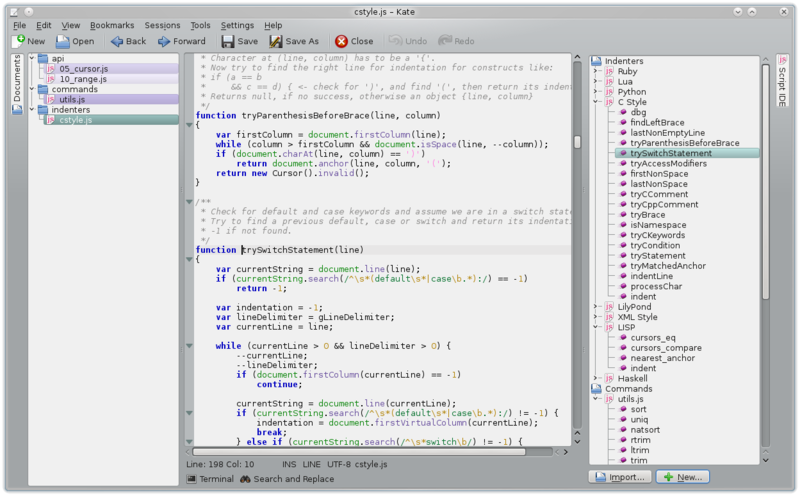 These extensions make creating your Kate project much easier I guess and avoid any battling with regular expressions to keep track of the important files.